1. To make the pastry, put the flour, rice flour and icing sugar into the bowl of a food processor. Blitz briefly to combine. Add the butter and pulse until the mixture resembles coarse breadcrumbs. In a small bowl beat together the egg yolk and about ½ tbsp ice-cold water. Add to the food processor and pulse until the pastry just starts to come together. 2. Tip out onto a clean work surface and use your hands to bring together into an even dough. Roll out on a clean, floured surface, in 2 batches if necessary, until the dough is the thickness of a pound coin. 3. Using a 7cm round cutter, make 24 circles and place them into 2 x 12-hole fairy cake tins. If you wish, use a small heart cutter to make 24 little hearts, rerolling the pastry if necessary. Fill each pastry case with 2 tsp of jam, using different flavours if liked. Top each with a heart, if using, and rest in the fridge for 30 minutes. 4. Preheat the oven to 190°C, gas mark 5. 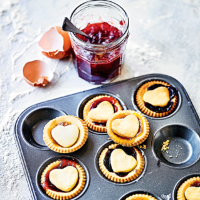 Bake for 18-20 minutes, swapping the tins around at half distance, until the tarts are golden around the edges and the jam is bubbly. Cool for 10 minutes before removing from the tins. This recipe was first published in Thu May 17 10:29:00 BST 2018.